Please check out my new blog, Swing Eats. Look for more to come, hopefully with Swing Eats baked goods headed your way. They're "gluttonous and good for you," full of puffery, and gluten-free of course! Why zucchini? Because zucchini was in abundance and cheap ($1.50/lb) at the farmers market. Guaranteed fresh and tasty. This souffle/casserole is easy to make and will compliment any meal. You can make it ahead, even serve it cold or at room temperature. Place the shredded zucchini in a colander over a bowl to contain the water from the zucchini. Toss in the salt and mix in thoroughly. In a medium/large mixing bowl, scramble the eggs. Then mix in the rest of the ingredients from the seasonings to the cheeses, to the cornstarch. Press the zucchini against the walls of the colander to remove excess water using a silicone spatula or your clean hands. Add to the egg mix and stir thoroughly. Turn into a greased medium casserole dish and baked until the top is evenly and lightly browned, about 35 minutes. These easy cheesy puffs are one of my favorites that I make for my family and friends, and they always beg for me. The technique to make these are different, but don't let that discourage you from making these. This "paste" of a dough is cooked on the stove top, cooled, and the eggs are slowly mixed in before baking off. Yes, it requires some elbow grease incorporating the eggs, but the reward is high. These puffs have a crisp exterior, a spongy almost custard like interior with a great aroma of cheese and aromatics. Sweet rice flour is the perfect flour for these puffs, even better than regular all-purpose (wheat) flour. Sweet rice flour is also know as "glutinous" rice flour even though it is gluten-free, and can be found in the Asian section, sometimes called mochi flour. Nothing else is needed - no xanthan or guar gums, not even baking powder. I added other aromatics to these such as garlic powder, nutmeg, and fresh chives. This is your opportunity to personalize these to your tastes. These are other great add-ins: parsley, rosemary, oregano, truffle salt, cayenne (with a very light hand), dried shallots or onions.... Oh yeah, another thing about this recipe - I have the measures in grams. You know how I feel about the ridiculous measurement error in volumetric measurements, ie, cups.... up to 200% error. If you don't own a scale, pick up a cheapy for under $20 just about at any major store. The only features you need are a tare/zero button, weighs in grams with a +/- 1 gram increments, and weighs in ounces (not fluid). Don't waste your money for a scale that claims is does it all, it doesn't. Optional: your choice of aromatics: pinches of granulated garlic, nutmeg, cayenne, mustard powder, white pepper, dried toasted onions or shallots, etc. Preheat oven to 425F, use convection if you have it. Combine the liquid, butter, aromatics and salt in a heavy saucepan. Bring the mixture to a full, rolling boil. Remove the pan from the heat and add the sweet rice flour all at once. Stir quickly using a strong utensil. Return the pan to moderate heat and stir vigorously until the dough forms a ball and pulls away from the sides, about 5 minutes. Remove form heat. Allow to cool slightly. With vigorous and thorough stirring, beat in the eggs a little at a time. Add no more than one-quarter of the eggs at once, and wait until they are completely worked in before adding more. When all the eggs are incorporated, add in the cheese and fresh herbs. Now it's ready to use. Using a small scooper (1/2-3/4 oz), portion out the paste onto parchment lined baking sheets. Sprinkle lightly with salt, and get in the oven ASAP, all at once. You don't want to open the oven once these guys are in until they're risen and browned. Bake for about 15-20 minutes until beautifully browned. Remove and allow to cool on wire racks. These store perfectly in the freezer. 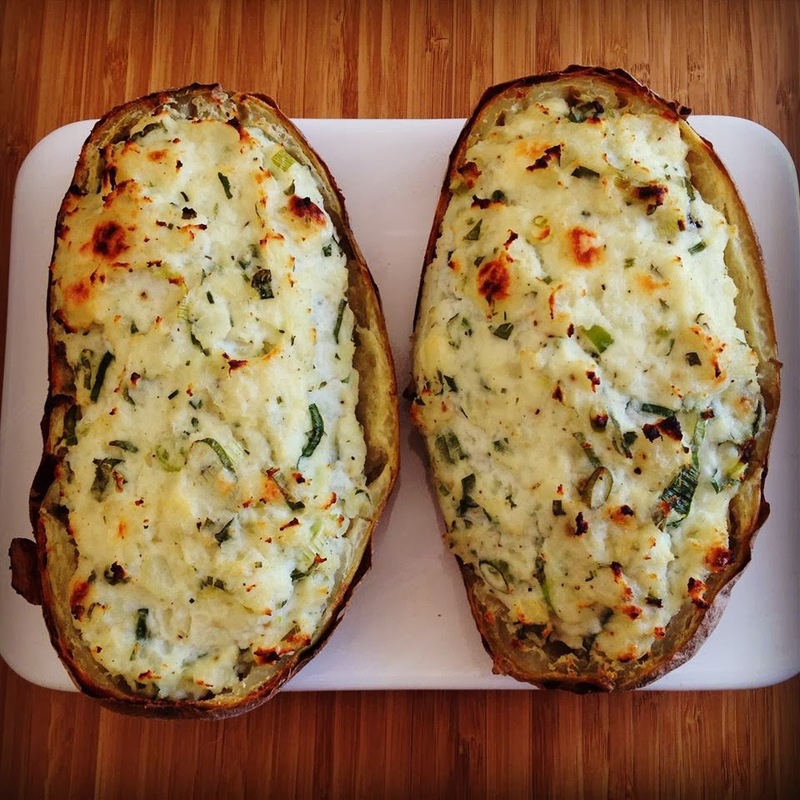 Just pop in the oven or toaster oven to warm up before serving. Makes about 30 cheesy puffs. I always say I should eat more salads. I like them, seriously. Usually, they seem like too much work just to make for myself. When I do, I like to keep them simple yet full of flavor and different textures. To be honest, I went to the farmer's market with no preconceived notion of what kind of salad to make; whatever looked good to me. The strawberries right now are so aromatic and cheap ($5 for 3 baskets), simply irresistible. Then I came across something that looked like dill with pretty tiny flowers, but knew it was not dill. When I asked the farmer what it was, he told me they were cilantro flowers. Ah, the frilly stuff that grows from my cilantro when it goes to seed. I never thought about using it, but at $1 I figured it'd be a cheap gamble. The smell of them were so light and fresh, seemed like a perfect pairing for the strawberries. And I'm a sucker for flowers on salads. For this salad I used feta, but I'd imagine soft goat cheese/chevre would work as well, too. I also added in some fresh spring onions and a vinaigrette for dressing. Compose salad with the lettuce on bottom, followed by the green onions, then the crumbled cheese, the strawberries (make them look pretty), and the flurry of cilantro flowers. In a cup, mix up a 1:1/oil:vinegar with seasonings and taste. Lightly pour over the salad and enjoy. While living in Barcelona, my love of Catalan food quickly developed. Trinxat (pronounced trin-shat) become one of my instant favorites. Trinxat is a pan-fried mashed potato and greens (of any ilk) cooked in garlic-infused rendered bacon fat. A traditional Catalan culinary oxymoron. I decided to change the recipe to cut out the bacon (I love you bacon, but you're taking a toll on my waistline.) and saute the greens with garlic in olive oil, then add it to the mashed potatoes with the skins still on. Added an egg for extra binding. In a large saucepan filled halfway with water and about a teaspoon of salt, add in the cubed potatoes, heat over medium-high heat. Remove from heat and drain off water when fork tender, about 15 minutes. Concurrently: In a large skillet/saute pan, heat 2 tablespoons olive oil over medium heat add in the chiffonaded chard and garlic. Saute until cooked through. Place the cooked, strained potatoes back into saucepan. Mash. Stir in the cooked greens and garlic. Taste for seasoning and add more salt and pepper to taste. Then add in and stir in egg. In the large skillet, heat up 2 tablespoons olive oil over medium heat. Drop the mash into patty forms into the skillet. Cook about 10 minutes per side until golden brown, and flip to brown other side. A better name for these are PB&J Spring Rolls with Apples. I don't have a kid, nor do I pretend to know the first thing about kids. I know what I like with flavors and textures, and know that kids are much more sensitive and picky than I am. For some reason, I've been thinking of new ways to use Vietnamese spring roll rice papers. I find the texture so appealing with its tender chewiness. Why not do a spring roll with peanut butter and jelly, add in some apples for texture and nutrition? Maybe for an adult version, add a little line of chili garlic sauce for a spicy complexity? In at least a 9" pan filled with cold water, soak one rice paper to hydrate for about 2-3 minutes. Carefully removed the softened rice paper onto a tea/dish towel or paper towels, and lay flat. At this time, put another rice paper in the water. Then towards the bottom center, place a strip of peanut butter, a parallel strip of jelly, then a few of the julianned apples. Fold up the bottom of the rice paper to cover the fillings. Fold in each side. Then gently, yet firmly, roll it up. Place on a plate. Repeat. Note: do not allow the rolls to touch each other since they are so sticky. To store, wrap individually in wax paper and keep in fridge. It's that time of year I feel resentful about being a Celiac - Girl Scout cookie season. The Do-Si-Dos were one of my favorites: the oatmeal peanut butter sandwich cookies. Lately, I've been into making bars from scratch. Why not come up with a more wholesome version of the Do-Si-Dos in a super simple bar form, with less sugar. This is it. You can cut the bars into smaller pieces and call them Do-si-do bites. Just mix a couple of ingredients in one bowl, put in a baking pan, bake, cool, and cut. The beauty with these is that you can bake them a shorter amount of time for a softer texture, a little longer for a crispier bar. I developed this recipe to be pretty simple in the flavor profile with only vanilla and salt. Putting in spices like cinnamon, cloves, nutmeg, mace, cardamom, etc can add complexity if you want that. This recipe is scaled for a toaster oven, using a half size brownie pan (7"x10"). If using a full sized brownie pan, just double this recipe. I love toaster oven sized recipes: great for the single person, watching portion sizes, being more energy conserving, and a lot easier scale to work with. In a medium bowl, scale/measure all the above ingredients. Mix very well using a heavy-duty spoon. Turn into a lightly greased pan. Evenly distribute into pan and smooth the surface. Bake for 25-30 minutes depending on desired texture. (25 min for soft, 30 min for crispy) If making a double batch, cook for 30-35 minutes. Remove from oven and allow to cool. While still warm, cut/score into desired sizes. Store in an air-tight container to keep fresh. When I was personal cheffing, my client was allergic to yeast, eggs, and lactose-intolerant in addition to having Celiac. He lived in Chicago and grew fond of Chicago deep dish pizza before I started cooking for him and learning of his dietary restrictions. My solution: using a crisped up polenta shell as the pizza pie crust, don't hold back on the fillings, and top with goat milk mozzarella (goat and sheep milk are naturally lactose-free). Instant new pizza love. It's just so different, yet very appealing while still obviously a deep dish pizza. A pizza pie reinvented. While it takes longer to make this polenta pizza pie crust since it's made from dry polenta, it is easier than a traditional pizza crust. The beauty lies in its natural rustic character, i.e., the more imperfect it is, the more appealing it is. Another beauty of this recipe is you can tailor it to your likes and needs. This pizza has two layers of filling: a spinach/sausage/shallot and a tomato sauce. Don't forget to taste each component along the way for the best tasting pizza pies. Swap out the sausage for spicy sausage, chicken sausage, bacon, or even mushrooms to make vegetarian. Swap out the cheese for your cheese of choice. The possibilities are endless, but it will be guaranteed to be delicious. Preheat oven to 325F. In a medium sauce pan, heat the polenta and water/stock over medium heat with some salt if necessary. With frequent stirring, cook down until it becomes the consistency of a thick porridge (about 20-30 minutes). Make sure to taste and add more salt if needed. Immediately divide evenly into a 12-muffin tin. Use something like a shot glass coated with oil to form into a shell with relatively uniform thickness walls. Bake in a 325F oven until lightly golden brown and crispy (about 20-30 minutes). While the polenta shells are baking, start preparing to 2 layers: tomato sauce; and the sauteed sausage and spinach. Tomato sauce: In a large skillet over medium heat, combine 1 tablespoon olive oil with the tomatoes, garlic, oregano, and chili flakes. Reduce heat to low and frequently stir until it cooks down to a nice thickness. Season with salt and pepper to taste. Spinach and sausage filling: In a large skillet over medium heat, combine 1 tablespoon olive oil with the chopped shallot or onion, and the sausage. Break up and sauteed frequently with a spatula. Once the sausage has browned, add in the chopped spinach and saute. Season with oregano, salt, and pepper to taste. Assemble the mini pizza pies: using a spoon, first spoon the sausage and spinach filling half way in all the shells, followed by filling the rest almost to the top with the tomato sauce. Sprinkle a little bit of the cheese on top. Place in a 375F oven for about 15 minutes until the cheese turns a little bubbly and/or browned. Allow to cool slightly before serving. Makes 12 mini polenta pizza pies. If there is any one general cookie generalization, it's "everyone is a cookie monster at heart." Cookie variations seems limitless. These are a variation on my peanut butter cookie for a European friend who doesn't have an infinity for peanut butter. I thought why not replace it with almonds. More fancy, too. These cookies are super easy to make and "paleo" with no grains or starches, but still has sugar. I think these are even fancy enough for an Academy Awards party. As a matter of fact, I put this batch in the freezer and will pull out on Sunday for an Oscars party I'll be attending. In a medium mixing bowl, using a wood or silicone spatula, mix together everything but the eggs. Only mix just until everything comes together. Do not over mix, or it will start to separate. Now add in 1 whole egg and the 1 egg white. Mix very gently until just until incorporated. Again, do not over mix. On a sheet of parchment, using a portioner/scooper/spoon measure out about 1/2 - 3/4 ounce of dough. Allow space between the cookies. Gently squash with something flat like the bottom of a measurement cup. Then push a single almond in the center. Bake for about 14 minutes. Remove and allow to cool on rack. Makes about 2- 2 1/2 dozen cookies. The way I usually determine what recipe I'm going to develop is based on what I have on hand. When I think of a well executed "gourmet" grilled cheese, I consider a complexity in textures and a simplicity in the melding of flavors. Given these considerations I came up with cave aged Vermont cheddar cheese, pink lady apple, walnuts, and fresh thyme. Really good, fresh, comforting... This is one of my favorite flavor combinations. I built the layers within the sandwich, and found that after grilling it on the stove top, placing it in a moderate oven for about 10 minutes melted it thoroughly and brought it all together. In practical terms: I could squash it all together to eat it. Scale this recipe accordingly to how many sandwiches you are going to make. Place a pat of butter on 1 side of a slice of bread. Place buttered side down in an oven safe skillet over low heat. From there carefully build the sandwich: a layer of cheese, a layer of sliced apples, a sprinkling of chopped walnuts, and thyme. I did two layer of apples, walnuts, and thyme, finishing with a layer of cheese so it all melts together and adheres the bread. Finish with the other slice of bread and a pat of butter on top. After about 3-5 minutes, carefully flip over the sandwich(es). Lightly brown the other side. Place skillet with sandwich(es) in heated oven for about 10 minutes, or until all the cheese has melted. Remove from oven and squash with the backside of a spatula. Transfer to a cutting board. Allow to cool/set up for a couple of minutes before cutting. Serve and eat immediately. This week's blog them is "comforting Valentine's desserts." My mind automatically goes to chocolate, then to panna cotta, then figuring out how I can incorporate Nutella into it. Normal progression of a normal person's thought pattern, right? I wanted to keep to the traditional panna cotta recipe, using sour cream to finish it, giving it a delicate brightness. I figured that could serve Nutella well. And it does. This recipe turned out to be very simplistic in its measurements and minimal in it ingredients (no added sugar needed! ), even though it looks super-fancy. 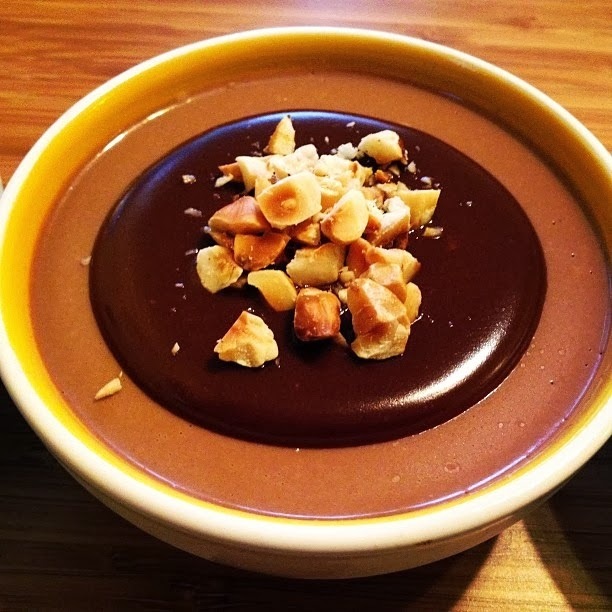 Just the plain Nutella panna cotta is plain brown. I put a rich Nutella and butter "chocolate button" on top with a sprinkling of chopped toasted hazelnuts for aesthetic and to add textural and flavor intensity. How I finished it reminds me of an old childhood favorite candy, Toffifany. (I found an old 1978 Toffifany commercial, "not too good for YOU!") Hopefully, this dessert works well to win the heart of a Valentine you have in mind. In a very small bowl, measure out the gelatin. Then slowly and gently put the cold water on top. Allow to sit and "bloom" the gelatin for at least 10 minutes. In a medium/smallish saucepan, measure and dump in 1 cup of cream and 1/2 cup of Nutella. Over low/medium heat, gently whisk continuously. Once it heats up over about 5 minutes, it should become homogenous. At this point, turn of the heat. Do not allow to boil. Add in the bloomed gelatin and whisk until it dissolves completely. Add in the pinch of salt and vanilla. Stir well. In a separate medium mixing bowl, measure in the 1/2 cup sour cream. Slowly add in the heated Nutella/cream/gelatin mixture while whisking well. Make sure it is smooth and no tiny lumps of sour cream. Pour and divide into 4 tiny bowls (I like the kids IKEA set), ramekins, tea cups, etc... Cover and refrigerate for at least 4 hours. Over very low heat in a tiny sauce pan, melt together the 1/2 cup Nutella with the 2 tablespoons butter with constant stirring. Once it gets liquid, cut the heat or it will get weird and clumpy. Immediately spoon 1-2 teaspoons of this molten goodness on the set up panna cottas and gently spread into a chocolate button. Repeat for all 4 portions. Place a tiny pile of the chopped, toasted hazelnuts on top of the chocolate button. Serve immediately, or keep in fridge until ready for serving. Makes 4 servings. Enjoy! I think it's time to bring arepas out from under the radar and into the spotlight. An arepa is a thick flat bread made from pre-cooked corn flour, and found ubiquitously in Venezuelan and Colombian cuisines. It has to be P.A.N. pre-cooked cornmeal, otherwise it will not work (if you're curious why - read this "production" section). (I find it locally at Von's in the Latino section. Kroger carries it, too.) I remember clearly the first time I had arepas. My Venezuelan roommate, Vivi, made them one night for dinner. She made about a dozen of the arepas and served them still piping hot with a variety of lunch meats, cheeses, butter, and salsa. I was in heaven. My new favorite comfort food, and naturally gluten-free. I figured these would be perfect as "sliders" for the big game. Everyone can customize them with whatever ingredients you feel like supplying. I felt more on the South American/exotic/whatever was easy side of ingredients with precooked BBQ pork from the grocery (one of those roasted chickens would work well, too), pepper jack cheese, queso freso, pan-seared plantains, avocados, black beans, and onions. Get creative, or keep it simple. It's your call. It's all about the arepas. My muse for arepas is Caracas Arepa Bar in New York City - I love this place! Just check it out and you will be inspired, too. In a large bowl, using clean hands, mix together the water, PAN, and salt. Work the dough well until it thickens a bit and comes together. Heat a large skillet or griddle over medium heat. Lightly oil the surface. Form the arepa cake using a handful of dough and shape it into a puck. Place on heated surface and cook for about 12 minutes undisturbed. Flip and cook for 12 minutes on the other side. Remove from heat. Allow to cool slightly. Serve immediately with your spread of choice. Makes about 10-12 arepa sliders.